Where is the “Thanks” for The Mashpee Wampanoags? 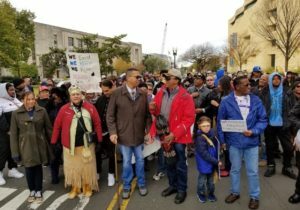 “Yesterday morning over 200 members of the Mashpee Wampanoag tribe, their allies, and supporters marched from the National Museum of the American Indian to the Capitol. They sang traditional songs, chanted slogans and held signs speaking out against the Department of the Interior’s September 7 announcement revoking the trust status of 321 acres of Mashpee land. The Department of Interior approved the Mashpee Wampanoag tribe’s application to put two parcels of land into trust status in 2015. The land in Mashpee and Taunton on Cape Cod would house a 123-unit elder and tribal housing facility and most notably a $1 billion casino and hotel complex. Rival business owners and casino developers blocked this by suing the government, saying the tribe was not eligible to have land placed into trust according to a 2009 U.S. Supreme Court ruling, Carcieri v. Salazar. In that case the Supreme Court ruled land could only be placed into trust status for tribes that were included in the 1934 Indian Reorganization Act. In the Mashpee case, the court ruled in favor of the rival business owners and developers, saying the Mashpee Wampanoag didn’t receive federal recognition until 2007 and so were not eligible to have trust land. On September 7, the Department of Interior formally took the tribe’s land out of trust status… Mashpee Wampanoag Vice-Chair Jessie Little Doe Baird called on all tribes to fight the Department of Interior’s decision. U.S. Representative Bill Keating, D-Massachusetts, co-authored legislation to reaffirm the trust status, H.R. 5244 and S. 2628. He spoke of the bipartisan support the tribe has in Congress. ‘We’re here because the administration has made a decision to go in one direction and Congress is here to try and straighten that out,’ he said. Rep. Joe Kennedy III, D-Massachusetts, and another author of the legislation, also spoke briefly about the unfairness suffered by the Department of Interior decision. Additionally, five representatives from the National Congress of American Indians spoke in support of the Mashpee…Members of other tribes facing land into trust issues were honored, in particular the Mashantucket Piquot Tribe and the Narragansett Indian tribe, including Chief Dean Stanton, as well as tribes from Alaska. 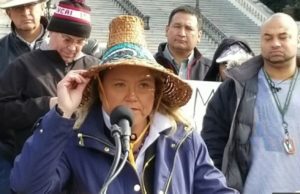 Among the many tribal leaders who spoke, Quinault President Fawn Sharp from Washington gave perhaps the most passionate speech. She pointed out how our country, under the current administration, is moving toward an era of termination, which she compared to a pit filled with flawed beliefs. As the Eastern Sons Drum Group led the gathering in the American Indian Movement honor song, people began pointing skyward. Circling high above, a hawk rode thermals, absorbing the prayers and carrying them to the spirits of our ancestors, evidence the gathering had power.